It arrives almost daily, around the same time usually. We are eager to go retrieve it, we welcome it into our home and just like that we dump it somewhere, usually the entry table or kitchen counter and then walk away and ignore it. We always pull out the good stuff such as a greeting card or invitation but the rest sits. The next day the new incoming mail gets plopped on top and the cycle continues. The anxiety inducing avalanche of paper clutter. When does the pile get looked at again? When you missed a bill payment? When you realize the store sale ended 3 weeks ago or when that huge pile of catalogs no longer stays stacked because they do that slippery slide thing? Let’s talk about how to tackle the junk and set up a clutter-reducing mail-management system. It is best to tackle the mail daily but if you need to make it a weekly task make sure it does not go past 7 days. Designate an in-box, it can be a basket, box or drawer. Make it large enough to hold one week’s worth of mail, but no more. Place it in a convenient spot that is not out of sight. We don’t want out of sight, out of mind happening. Five minutes.. five minutes a day is all you need to sort your incoming mail and say Good-Bye to the pile forever. Your very first line of defense after collecting the mail should be the recycle container. I immediately dump all store ads, advertisement cards and obvious junk mail in the garage recycling. If you are on week 55 of telling yourself you are going to look at the grocery store ads but you never have then it’s time to admit it’s not going to happen, and put them in the bin upon arriving. OK, so now your pile is much smaller and less scary. Next take it in to your sorting station (ie, kitchen counter) and keep it simple. Bills, Read, and Shred — and maybe one more, catalogs. If you think you might need that invitation or local-restaurant coupon have one spot in or near your kitchen (mine is on a board with my calendar) where you can keep such items for one month only. When the last day of the month hits, throw away what you haven’t used. Bills immediately go to your bill paying area (mine is my desk). The read pile can be looked at immediately or saved for looking at with your nightly cup of tea or after the kiddos are in bed. Examples of read are thank you for your recent purchase, you have a dentist appointment scheduled, donation solicitation, etc. All of those go into the shred pile (its good practice to shred everything with your name on it, especially anything from a financial institution.) I try to shred promptly, therefore avoiding another pile. 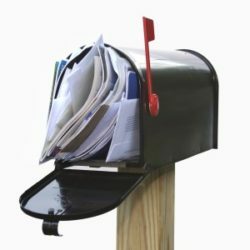 I feel that catalogs and unwanted junk mail deserve a blog of their own so please check back next week and learn how to OPT OUT and give your mailbox Room to Breathe.